Dubai: Some malls in Dubai have extended their operating hours at least once during the five-week Dubai Shopping Festival (DSF) in order to accommodate late-night shoppers. DSF has recently introduced a new initiative called “Shop the Night Away”, during which stores at one major shopping centre bump up the money-saving deals and discounts from 6pm and stay open until midnight. The offer is on only every Wednesday and is a great chance for last-minute shoppers to finish up their bargain-hunting spree. Foot traffic at the stores usually increase in the evening, particularly during weekdays. So far, Dubai Mall and Mall of the Emirates had already introduced midnight shopping last January 16 and 23, respectively. The retail bonanza’s organisers announced that, for this week’s round of extended shopping, Majid Al Futtaim’s Dubai Festival City Mall will be opening its doors until midnight. A spokesperson for the Dubai Festivals and Retail Establishment (DFRE) said the promotion was launched only this year and it seeks to provide shoppers with “extra value-added deals” at select malls once a week. The state-backed shopping extravaganza is moving towards its final week. It started on December 26, 2018 and will end on February 2, 2019. 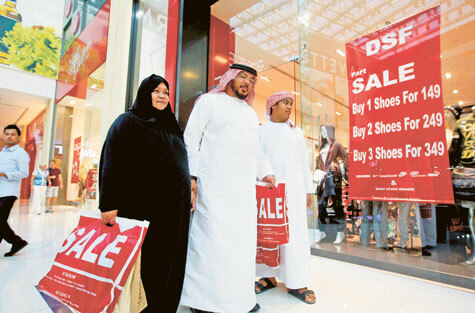 DSF is a regular fixture of Dubai’s retail calendar and has been regarded as a key driver of consumption in the UAE. Since it started in February 16, 1996, consumer spending during the retail event has been on the rise. Studies have shown that people tend to swipe their cards or open their wallets more during the shopping festival. Data from Network International showed that card spending volumes during DSF increased by 6.75 per cent in 2018 compared to 2017. “Dubai Shopping Festival has formed the cornerstone of our highly successful retail initiatives for over two decades now. Thanks to the continued collaboration and drive of our government and private sectors partners, DSF has returned on a larger scale this year, spanning an impressive five weeks.,” said Ahmed Al Khaja, CEO of DFRE. “The Dubai Shopping Festival (DSF) is more than a retail extravaganza – it is a significant catalyst for Dubai’s economy, supporting tourism and setting the pace of growth for the entire year,” added Patrick Bousquet-Chavanne, CEO of Emaar Malls.